A few weeks ago, I met Kirsty (You Had Me at Bonjour, Kirsty) for dinner in Aix at a cozy place called, Hue Cocotte (we had let our husbands come along too and we all had a marvelous time... like a getting home at 2am kind of marvelous time). Well on that night, I saw Aix-en-Provence dressed up in it's Christmas finest for the very first time. I was in awe, Aix certainly knows how to impress when it comes to putting on the dazzle. I knew that I would have to go back with my mother in tow. Fast forward to last weekend when we were in Toulon... I was telling Mrs. London how Christmassy Aix was looking and wouldn't it be lovely to stroll though the Christmas market, stopping for a Nutella crêpe or some mulled wine (them, not me, I don't do mulled wine). And that's when our holly, jolly, plan came together... we would meet in Aix one night during the week to take in some Christmas joy. As for me, I couldn't have been more excited with the plan, I'd be free to take my time admiring all of the Santons and holiday candy on display under the twinkling lights of Cours Mirabeau, without the dreaded huff and puff of The Husband because he would be distracted with Guinness and Mr. London in an Irish pub somewhere. Well we weren't counting on it being freaking freezing. We met Mr & Mrs London at Le Belle Epoque for a drink, and since it was so warm inside, and so cold outside, we ended up staying put. Christmas market, what Christmas market? It was a holly, jolly, fail. La Professeur (my good friend and French tutor) had contacted me awhile back, asking if I would be able to help her with a secret something that would spread some holiday cheer. Now, I'm all about the holiday cheer, so of course I told her to count me in. See, her husband is a life long Toulon fan, and La Professeur wanted to know if there was anyway I could get a rugby ball to Mr. London so he and maybe some other players could sign it for her husband for Christmas. The least I could do was try. So last weekend I arrived in Toulon with a brand new ball, and handed it off to Mr. London. When that little Christmas angel gave it back to me there was barely a blank spot on it! He managed to get every player to sign it... everyone single one of them! I was so happy for La Professeur that I almost cried. The joy at her house on Christmas morning is going to be spectacular! But here's the thing... I don't always have the fullest confidence in La Poste (for example; I'm waiting on a box that was sent from Dublin on the 13th, the last tracking notice has it leaving Heathrow early morning on the 14th... where is it La Poste, WHERE?!). And since La Professeur lives an hour and a half away from The LPV, but only thirty minutes from Aix, I called her up and said, "hey, do you want to meet in Aix, we'll have a drink, you can meet my mom, and I'll deliver the special holly, jolly package?" She thought that was a fantastic idea. well thanks to Mr. London anyway. Nothing like Christmas decorations -- I feel like France has improved in that department since I moved here in 1990. Santa Sara!! I'd never thank you enough for helping me giving a Christmas miracle to remember to the man I love!! I have enjoyed the plotting with you a lot actually, and he still talks about the meeting with Mr London ("Is he the REAL one???". The whole world should know how generous you are Sara. How you make things happen. I admire you for this and for the beauty of your heart and soul. I wish you the sweetest, the most magical Christmas!! Ha, my colleagues have spent most of December telling me I needed to go to the Christmas market, how wonderful the food was for lunch, and every day I looked out the window at the pishing rain and politely declined (are they freaking nuts?!) Glad you had fun playing elf, sounds like the recipient may burst when he gets his final pressie! I think you've gone to the top of the 'nice' list now! Great story and I'm jealous of your Aix-mas lights shots, they came out really well. Ahh! That's the best Christmas story I've read. You are nice! I hope there's something just as special for under your fabulous tree. Happy Christmas & Joyeux Noël to everyone in the LPV. Thanks for making me smile all year. You are definitely Santa's best little helper! As they (might) say in Texas, "ya done good, Girl!". A very, Merry Noel, Sara! That was very sweet of you to arrange for your Professor's husband's surprise for Christmas. Too bad it was too cold to stroll around Aix and see all of the pretty sight. 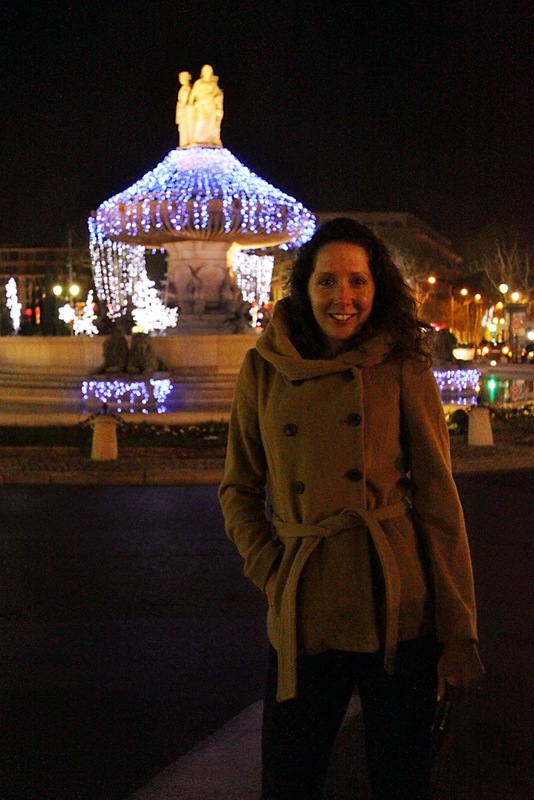 I think Aix is great any time of the year so I am sure it has to be spectacular during the holidays. Merry Christmas to all of you in LPV. What a perfect surprise!!!! I love it! I can so relate to the freezing bit. :) Looks like such a lovely, fun Christmas season for you! And especially for Professeur's husband!!! I wish you a wonderful Christmas Sara Louise! Y'all are all over the place. Merry Christmas Sara! This is awesome. Also, WHY do we not have Christmas markets in the states?